! MAGIC unan FIGHT !. LLLLOOOVVEEEE IIITTTT. HD Wallpaper and background images in the Severus Snape club tagged: severus snape snape harry potter snarry severus. This Severus Snape fan art might contain silid guhitan. 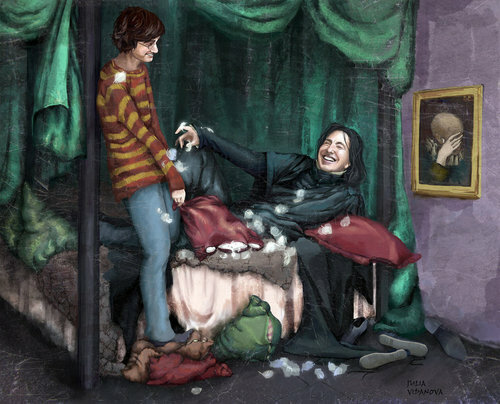 I could imagine that scene had Severus survived and come to terms with Harry (nothing slash here). This pic does some terrible things to me...there's just so much that could happen in that bed...OMFH. By the way...Severus is simply beautiful. Like the picture. Nice thoughts come to mind. I love how the painting next to the bed is facepalming! Uhmmmm, can I play??? LOL! I love how relaxed and happy they both look. Severus looks wonderful!